Singapore's biggest new hospital with 1,000 beds will open on Saturday. When it is fully open, Sengkang General Hospital (SKH) will significantly bump up the total number of public-sector acute beds from just over 8,600 now. The next public general hospital to open will be in Woodlands, in 2022. The Ministry of Health (MOH) will then take a pause to plan for future healthcare needs, said Health Minister Gan Kim Yong yesterday. SKH will start with 260 beds and increase to 500 in six months. 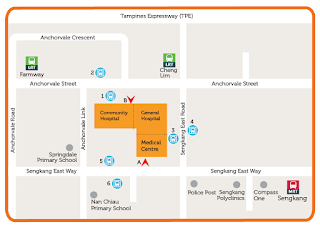 The hospital is within walking distance of the Sengkang MRT station and linked directly to the LRT station. The 400-bed Sengkang Community Hospital attached to SKH will open on Aug 28, as it takes a while for patients from the general hospital to need rehabilitation at a community hospital. Announcing the dates at the SKH Campus Community Health Fair, Mr Gan said that as Singapore's population ages, there will be increased demand for healthcare services. The Government has been building more facilities across various sectors to meet this growing demand, he said. Since 2011, it has added 1,700 acute hospital beds and 1,200 community hospital beds. 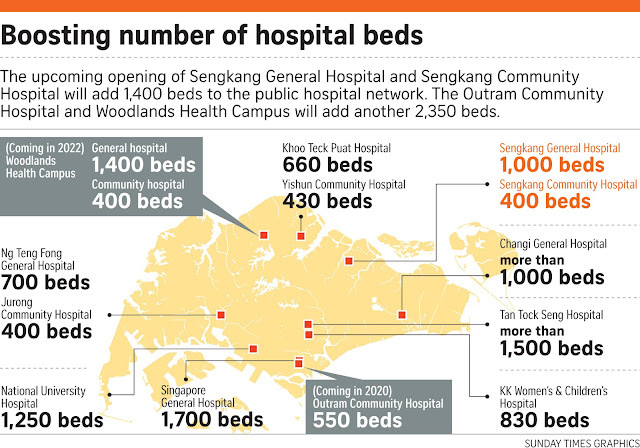 The hospitals in Sengkang will add another 1,400 beds to this. They are part of the new generation of public general hospitals, starting with the 660-bed Khoo Teck Puat Hospital (KTPH) in Yishun which opened in 2010, and the 700-bed Ng Teng Fong General Hospital in Jurong East in 2015. The Woodlands general hospital will add another 1,400 beds. It will be part of the Woodlands Health Campus, which will also have a community hospital and other healthcare facilities. "Beyond Woodlands, we will take a bit of time to plan for future needs," said Mr Gan. "Healthcare needs will expand, given the ageing population, but the care model may change. It is important to take a bit of time to plan for... future needs." Dr Lam Pin Min, Senior Minister of State for Health and Transport, and MP for Sengkang West, said MOH is pushing for more ambulant care with shorter hospital stays, which could cut the need for hospital beds. The average length of stay in public hospitals has already fallen from 5.9 days in 2015 to 5.5 days for the first half of this year. Singapore faced a massive bed crunch in 2013 to 2014 as public hospitals struggled with full occupancy. Patients had to be housed along corridors and in converted carpark areas. Occupancy rates now hover around 90 per cent. Dr Lam said the additional 1,000 acute hospital beds at SKH, which he expects to be fully opened within a year, will help with the rising demand for hospital care. Admissions to public acute hospitals rose by about 5 per cent from 416,663 in 2016 to 436,882 last year. Dr Lam said SKH will relieve the bed situation at KTPH and Tan Tock Seng Hospital, where many residents in the north-east now visit. These hospitals now have the highest occupancy rates in Singapore, sometimes above 95 per cent. Most private hospitals aim for 70 per cent to 80 per cent occupancy rates. Professor Christopher Cheng, chief executive officer of SKH, said should there be a surge in demand, the two Sengkang hospitals can add 200 to 300 more beds to the 1,400 they will offer. 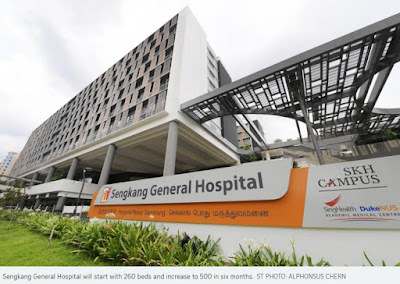 The opening of the Sengkang General Hospital (SKH) and Sengkang Community Hospital (SKCH) later this month will make it easier for people living in the north-east to receive quality and affordable healthcare closer to home, said Health Minister Gan Kim Yong. Speaking at the SKH Campus Community Health Fair yesterday, he said that through partnerships with the National Heart Centre, Singapore National Eye Centre (SNEC) and the National Cancer Centre, among others, the SKH campus will also offer residents easy access to specialist services. These specialist centres are part of the SingHealth group to which the two hospitals belong. Professor Christopher Cheng, chief executive officer of SKH, said experts from KK Women's and Children's Hospital (KKH), also part of SingHealth, will provide antenatal care at the SKH, but women will need to go to KKH to give birth. Professor Wong Tien Yin, medical director of the SNEC, said the eye centre will provide seven to 10 specialists for SKH, as well as nursing staff. They will be able to treat patients for cataract, glaucoma and diabetic retinopathy, as well as trauma cases affecting the eyes. But if the eye problem is more serious, patients will be referred to the SNEC for further care, he added. He said this was the new model of care in the SingHealth cluster, where specialists from the heart and cancer centres would treat patients at regional hospitals such as SKH and Changi General Hospital. Prof Cheng said SKH has adopted the best practices of existing hospitals. For example, its emergency department follows that of Khoo Teck Puat Hospital and separates serious ambulance cases from walk-in patients. Emergency doctors from other hospitals had said this was the best way to get very sick patients the speediest care. At SKH, patients with multiple problems will have one primary specialist who will coordinate all his treatments "from pre-illness to discharge back to the community", said Prof Cheng. The two Sengkang hospitals share a central kitchen which can deliver up to 1,500 meals per meal period. It can also provide a variety of normal meals and cater to special dietary requirements. There is also a modern rehabilitation centre with the latest equipment to help patients recover as fully as possible. The majority of beds in the two hospitals will be in subsidised B2 and C class wards. SKCH will have 17 beds for palliative care. Each subsidised ward has five beds with an adjoining air-conditioned nursing station. These wards also have fans and natural ventilation. The only difference between a C class ward, which offers a 65 per cent to 80 per cent subsidy, and a B2 ward, which offers a 50 per cent to 65 per cent subsidy, is separate toilet and shower facilities in the B2 ward. In the C class ward, a patient who wants to use the toilet must wait if another is having a shower. Ms Margaret Lee, chief executive officer of SingHealth Community Hospitals, expects patients to stay about three weeks at the community hospital before being discharged. Like other new community hospitals, patients are encouraged to eat at a table rather than in bed, and to relax in a lounge area. SingHealth Community Hospitals includes the 318-bed Bright Vision Hospital in Lorong Napiri off Yio Chu Kang Road, and will later include the Outram Community Hospital which will open at the Singapore General Hospital campus in 2020.